IN Pradip Krishan’s Massey Sahib, Francis Massey (Raghuvir Yadav) was an Indian Christian clerk attached to the British Commissioner, Charles Adam. On account of his close proximity to the British, Massey aspires to become one of them. He has a mind vibrant with fertile schemes. When his boss needs funds to lay a road through a forest, Massey manages to get the project completed through financial skullduggery. An unofficial road tax he levies to raise funds is considered by the boss as an act of corruption, though he had overlooked Massey’s earlier shenanigans. Raghuvir Yadav set the screen afire with his persuasively intense performance as a clerk who is ambitious but not clever enough to manoeuvre exotic rules and regulations that land him into trouble. Subhash Ghai’s Karma was an action-packed thriller about terrorists, aided and abetted by neighbouring states. The obsterperous Dr Dang (Anupam Kher), head of the Black Star Organisation, a group of International terrorists, arranges to bomb the jail during his escape bid. In this bomb-blast, the entire family of Rana Vishnu Pratap Singh (Dilip Kumar), jail warden, is killed except his wife (Nutan) and his youngest son. Hell bent upon on liquidating terrorism, Rana gets the charge of anti-terrorists squad comprising three hard-boiled criminals — Naseeruddin Shah, Anil Kapoor and Jackie Shroff, who have been condemned to death. Rana trains this ignoble trio and turns them into true soldiers and sons of the soil. With their daredevilery, valour and patriotism, they not only save the nation from doom but overwhelm the enemy’s heavily guarded military retreat. Anupam Kher as Dr Dang matched strides with Dilip Kumar. Pride, pain and passion throb through Dilip’s voice modulations. Mahesh Bhatt’s Naam was an exegesis on alienation. Sanjay Dutt and Kumar Gaurav are brothers closely bonded despite some innate frictions that generally exist between half-brothers. Sanjay is an ambitious guy and wants to go abroad to make his future. His brother and his mother (Nutan) oppose his decision, arguing ‘East or West Home is the best! Unheeding their entreaties, Sanjay goes to Dubai. There he gets into smuggling, but soon realises the futility of making mountains of money by killing his conscience. He wants to go back to his family, but finds it impossible to get out of the vicious circle he is trapped into. Sensing his brother to be in dire straits, Gaurav comes to Dubai but by now it is too late and he is unable to save his brother who is killed. Gaurav gave a polished and restrained performance, but Sanjay stole the show in the role of wayward but well-meaning son. He transposed on the screen his character’s anguish and pain mesmerisingly. ‘Chitthi aayi hai watan sey chitthi aiyi hai’ in the vocals of Pankaj Udhas make the audiences sit up and think about the futility of leaving one’s own motherland in search of greener pastures abroad. Sukhwant Dhadda’s Ek Chadar Maili Si was a poignant saga portraying the Punjabi custom of the younger brother marrying his widowed bhabi. The sudden and untimely demise of her husband forces Hema Malini into an unwanted marriage with her devar Rishi Kapoor whom she has brought up like a son. The new relationship is too embarrassing and shocking for both of them. Consequently, Rishi Kapoor hits the bottle to drown his sorrow, while Hema Malini slips into depression. Her daughter revolts as equations in the family change unpredictably. By and by, Hema and Rishi learn to cope with the situation. Ultimately, both compromise with their circumstances and succeed in making their marriage a virtue of the necessity. Hema Malini earned rave notices for her assured performance and carved a niche in the industry for her deglamourised role. Vijaya Mehta’s Rao Saheb evoked the plight of progressive liberals who are unable to overcome orthodox traditions. Rao Saheb (Anupam Kher), an educated but orthodox barrister, lives with his elder brother, widowed younger sister and the aunt who is also a widow. Both the widows are consigned to their traditional lot: tonsure, seclusion and celibacy. This lugubrious world comes to life when Bhaurao moves into the house next-door with his young wife Radhika (Tanvi Azmi). One stormy night, Bhaurao ventures out to look for Rao Saheb’s brother who had run away from home. Taken ill with pneumonia, Bhaurao dies. Radhika’s father-in-law orders the village barber to tonsure her head, but Rao Saheb steps in and persuades her to let her hair grow. Rao Saheb dithers when he is advised by his aunt to marry Radhika, As he is paralysed with fear & indecision, Radhika calls for a barber and gets her head shaved. In Ek Pal Kalpana Lajmi painted a different and daring portrait of an Indian woman — a woman who is capable of expressing her sexuality without any regret and remorse. In the luxurious world of a tea plantations of Assam, Priyam (Shabana Azmi) marries Ved (Naseeruddin Shah), a wealthy, estate owner. He is a workaholic and is not attentive to his wife’s solitude. The situation is exacerbated by her inability to conceive following a miscarriage. When Ved goes to the USA for a year, Priyam has a sexual fling with a boy who had courted her before marriage. Priyam conceives but decides to keep the child, although scandal is inevitable. Ved returns almost after a year and is happy to see Priyam carrying a child. Ved accepts both his wife and her baby. Shabana lent a feminist sensibility to her character, which had some grey shades. Muzaffar Ali’s Anjuman was a sordid melodrama about the plight of chikan embroiderers in Lucknow. Anjuman (Shabana Azmi) suppliments her family’s meagre income by doing chikan work. She is a beautiful, sensitive, determined and self-willed woman. Against her wishes, she is courted by Banke Nawab, a phoney poet, who has a lion’s share in the workshop where Anjuman works. Anjuman takes up the cause of many women workers whose eyesight has been ruined by embroidery work. She leads a struggle amongst the chikan’s workers for better working conditions and remuneration. In the process, she becomes a social activist. She turns down the offer of an alliance with Banke Nawab. Her rejected suitor exploits religion in order to stir up inter community passions between Sunni and Shia Muslims. Anjuman gains the admiration of the man she loves- Sajjid (Farouque Shaikh). Shabana rediated an easy confidence that enamoured the audience. 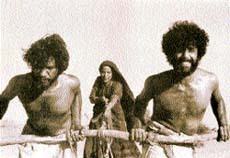 Mrinal Sen’s Genesis portrayed with warmth a farmer (Naseeruddin Shah) and a weaver (Om Puri) who survive a devastating drought. With hard labour, they recreate a society in its primitive serenity. They exchange their products for goods provided by a passing trader. Shabana Azmi, whose husband and child are carried off by flood, arrives, focusing the two men’s desires. She urges them to demand more recompense from the crafty trader who exploits them. She ends up creating in Puri and Shah feelings of competition for possessing her. The two men become more acquisitive and jealousy breaks out over the now pregnant woman who is not able to tell who the father is. She knows that their desire to assert their right over her and the child will precipitate violence. As the two men fight, the trader and his henchmen arrive with bulldozers to raze anachronistic Eden in the capitalist system. Shabana, Shah and Puri acted with conviction to leave footprints of histrionises on the sands of time.